I’m way late to this series, but one of the advantages to this is that I don’t have to wait for a new book to be released! When Chelsea at The Suspense is Thrilling Me asked if I had read Becky Masterman and I said no, she was sweet enough to send me the first two books. Then I recently received the third from the publisher and figured it was about time I started reading about Brigid Quinn. I’ve been hopping into a lot of new to me series in the middle, but I’m so glad I started at the beginning as this was such a fantastic read. Brigid is one of the most interesting and original protagonists that I’ve come across in a long time. She has such a multifaceted personality, there are so many layers to peel back to find out who she truly is inside, but what Masterman revealed in this series opener was a woman who is tough, determined, sharp, raw, and wholly relatable. She was also really quirky and when she’s uncomfortable or just trying to dodge a pointed question she deflects with black humor, I love that characteristic. Having a more mature woman as the lead in a crime series is clever and I really appreciated it. Brigid is a retired FBI agent living in Tucson, Arizona and reading a novel set in a familiar place was really fun. Masterman captured the rugged beauty of my home state perfectly and being able to recall places I’ve been to myself was fun! The fact that Brigid is no longer employed by the FBI made for some tricky investigative maneuvers on her part which added another breath of fresh air to this already highly original story. 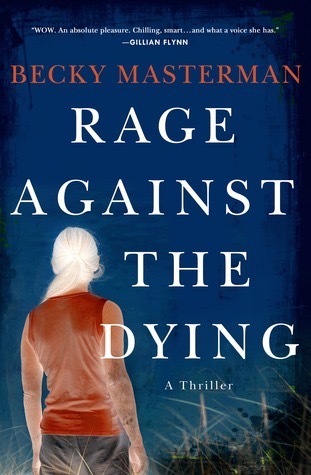 This was pretty violent and graphic, think Karin Slaughter in terms of the visual descriptions. The writing is fluid and Brigid narrates in a very conversational style that makes you feel like you’re chatting with an old friend. The plot twists were unexpected and I devoured this in a few hours, it was that gripping. I’m really glad I decided to binge this series straight through as I’m dying to know what happens next. Ah great review, I’m so glad you loved it, I’ve got this on my shelf waiting to be read! It’s so good Janel! I’m reading the 3 book now and the series is excellent. Yay! Yes, you can 😂 I’m still thinking about doing a half personal TBR challenge and half review copy month this summer, how’s July for you? Perfect and that’s plenty of time to plan! Haha I just finished a Karin Slaughter and I know what you mean by graphic…ew! 😀 This sounds great!!! Oh good Renee that’s like asking me to pick my favorite child! 😂 So this series is only 3 books so start here, you’ll get done faster. The KS series is much longer start that next! ok…I officially have 3 series to read😂I have the Jane Casey one as well! Oh yay that makes my black heart so happy 😂 How did you like Sister Sister? Six Stories was brilliant. I enjoyed Sister Sister a lot. Fun read. I am still weighing in a few small things though 😉 I also noticed a few mistypes/errors which drive me bonkers haha. Oh gosh haha that is annoying! It is! There were times where it was almost confusing. But the end results were still rewarding.